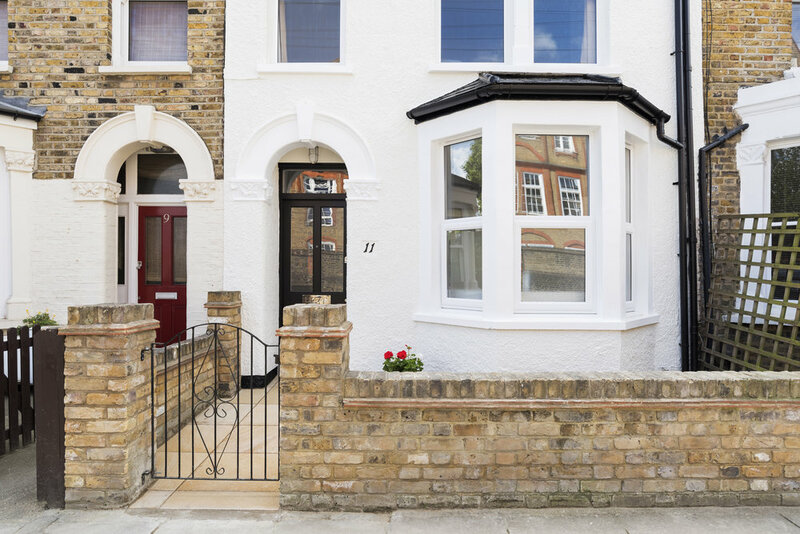 This typical Victorian terraced property was originally designed in the then growing suburb of to South East London to house aspiring families that worked locally or in industries related to the Thames dockyards. An ornate projecting bay window with a formal corniced dining room /parlour would have purposefully displayed the belongings and middle-class aspirations of the family to the passing public. 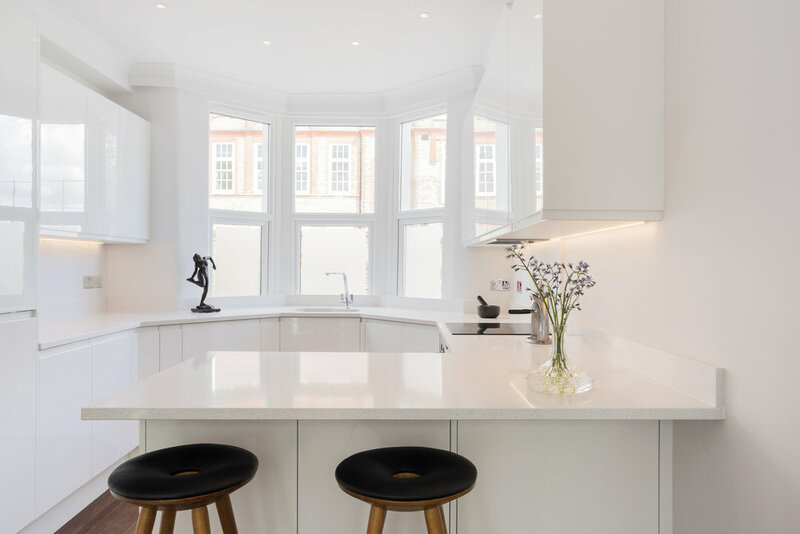 The servery and kitchen functions were originally located to the more private rear of the property for plumbing and drainage. Contemporary usage of this narrow front room has typically become more private and for living room use. The uncomfortable difference in eye level between the passing pedestrian public looking down upon the private television viewer has resulted with permanently drawn curtains or the addition of plantation style shutters to retain privacy. These additions to the bay window have significantly reduced both the amount of daylight entering the contemporary home and the amount of natural surveillance and policing of the public realm. 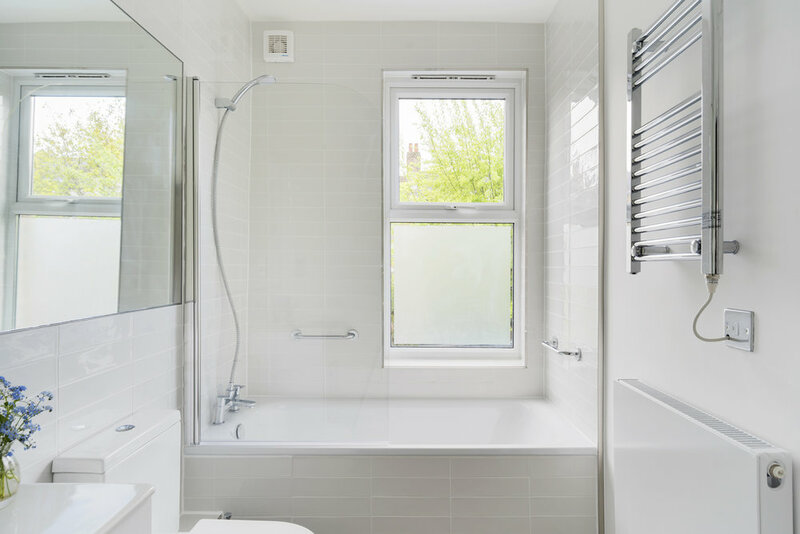 The aim of this project was to reclaim the neighbourly function of surveillance and to instead locate the kitchen sink directly into the bay window facing and policing the street. This arrangement efficiently occupies the 3m wide front room and allows the functions of dining and living areas to fit flexibly within the larger 4.7m wide x 7.2m long (30sqm) family space. 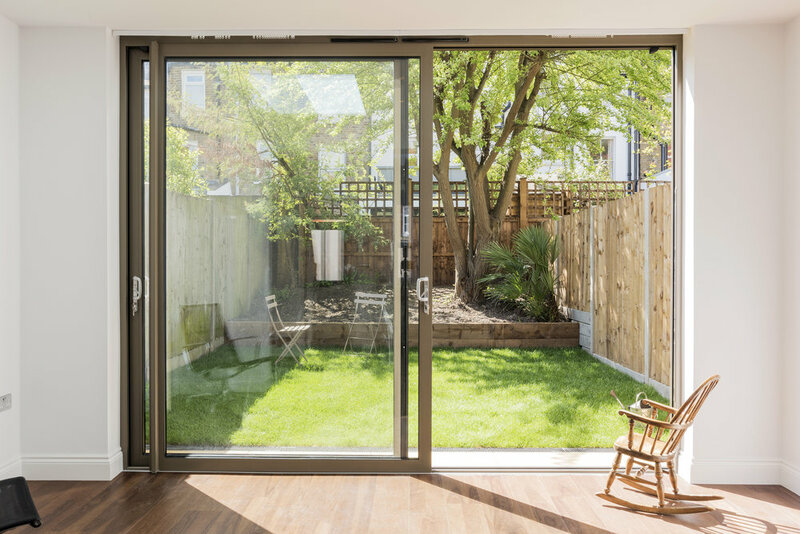 This room is daylit with two large sky-lights and sliding doors and leads directly to the south facing garden. A series of historic ad-hoc structural alterations since the 1980s had caused the property to suffer from subsidence that prevented it from being sold or rented at a desired local market value . 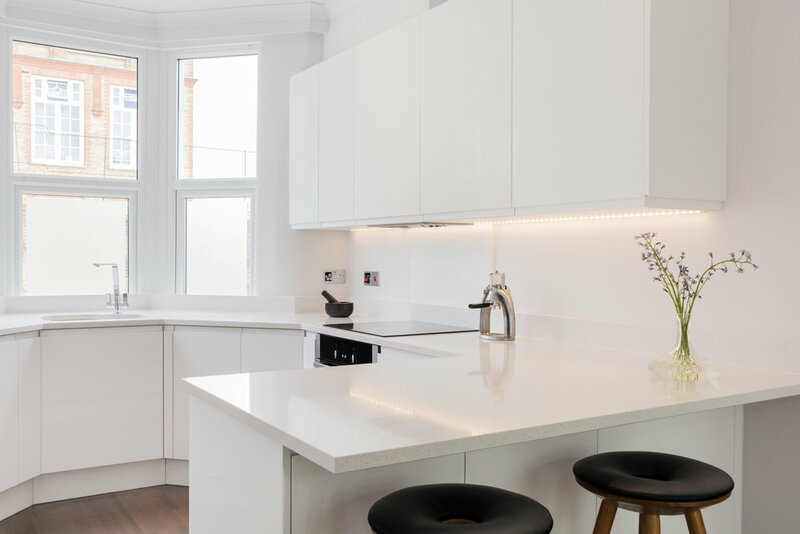 The project entailed a full refurbishment and portal frame structural extension to plan for a 25 year period of rental with minimum maintenance costs. Neutral plain white surfaces and colours were chosen throughout to simplify future maintenance and to allow future tenants to redecorate and inhabit as they wish. 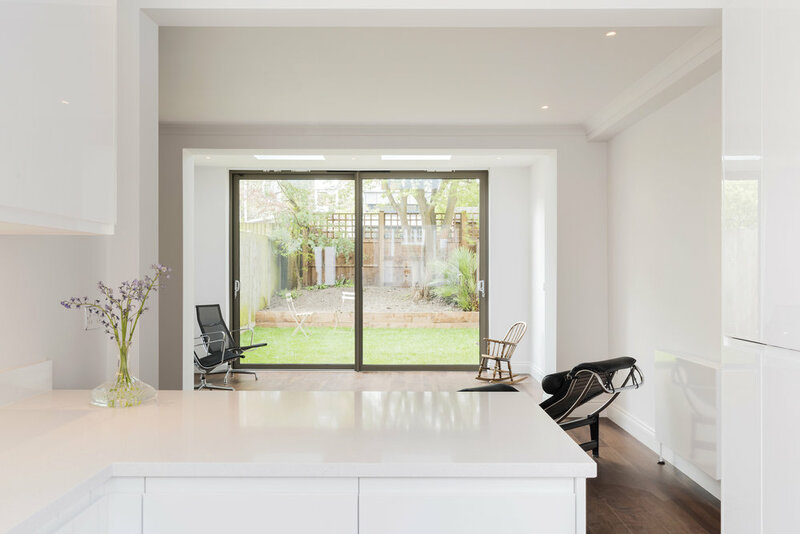 It was important that neither cold nor warm colours were introduced that might clash with any future tenant’s colour scheme for their furniture or decorations, and so a dark and robust walnut floor finish was specified to run continuously from the garden into the kitchen. The material specified was a robust, easy-to-install and economical choice, that provides for a dark contrast to the walls and joinery snow-blindness. 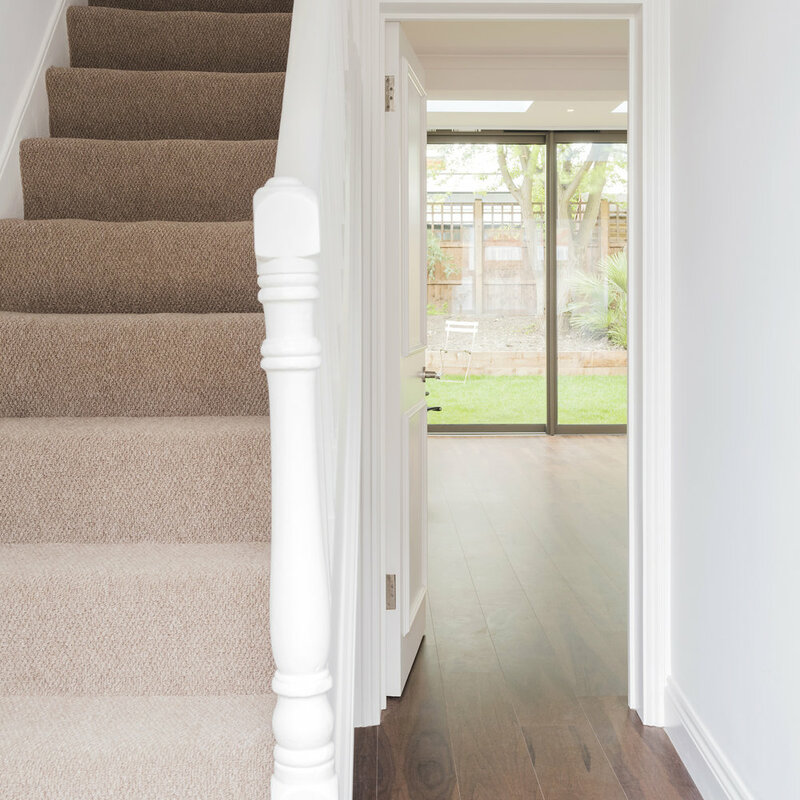 This generates a neutral yet elegant background easy to be personalised by future tenants. The property was rented within just three hours after being advertised by a local Estate Agent, Harvey & Wheeler.